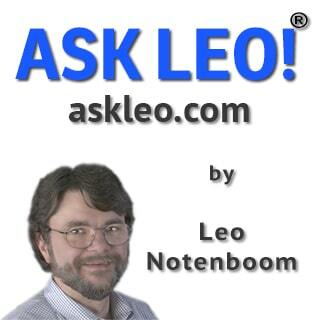 If you're getting SSL certificate errors when visiting Ask Leo!, or even viewing this email message, please read this article: Why am I getting certificate errors when I click on links in your newsletter? Yes, if you're experiencing the problem then that link may also generate the same error. I assure you, it's safe. The problem is simply due to old, unsupported software unable to deal with modern https protocols. Congratulations! You've received a new computer! Of course you want to jump right in and start using it, but there are a few tasks you can do now that will reap benefits later. These are things that, later, when all heck breaks loose and the machine dies, the software crashes, or you get a massive malware infection, will save you lots and lots of time and grief. Every day people lose data, precious memories, and valuable time because they didn't take a few simple steps along the way to prepare. I'm a very strong believer in using two-factor authentication for important online accounts. For example, I rely heavily on Gmail and I have it protected using Google's two-factor authentication option. Even if they somehow got my password a hacker still wouldn't be able to get in. Two-factor authentication (often referred to as multi-factor authentication, 2FA, or MFA) adds the requirement of "something you have" to "something you know" in order to log in to an online service. You're already familiar with something you know: that's a password. Something you have might be a mobile phone capable of receiving a text message, an authenticator application running on a mobile device, a dedicated key fob, or even a specialized USB device. Two-factor authentication simply means that you provide not only a password, but you must also prove that you have the second factor in your possession. If you don't, you can't log in even if you know the password. Neither can hackers – and that's the point. Failing to prepare for loss of that second factor, however, is an easily overlooked, yet easily avoidable risk of two-factor authentication. The risk? Losing access to that important account … forever. How do I remove a website from my computer? I get this question surprisingly often. Unfortunately, it reflects a fundamental misunderstanding of exactly how things work. Unless you're an actual website developer, websites aren't on your computer. I'm not saying there isn't a problem or something annoying going on – there probably is. But a website "on" your computer isn't it. Let's look at why the difference matters, and what kind of problem this might really be. Continue Reading: How do I remove a website from my computer? Do I need everything installed by Microsoft Update? 'tis the season ... to unsubscribe! Two factor authentication is a mechanism for verifying identity that relies on two different types of things, both of which must be correct, in order to allow access. Traditionally authentication has been in the form of something you know: i.e. a password, and perhaps the accompanying answers to a set of security questions. Since this is simply based on knowledge (if you know your password you must be authorized to access this account) it's easily transferred from one person to another – intentionally or otherwise. The most common form of two-factor authentication adds something you have to the requirements – you must prove that you are in position of something specific, something that is completely unique to you and of which there is only one. A popular implementation of this is in the form of key chain fobs or smartphone applications such as Google Authenticator which present a 6 digit number that changes every 30 seconds. That 6 digit number is generated by a cryptographic algorithm and is tied to your account in such a way that only your device has the correct number for your account at any point in time. Because the algorithm used to generate the number is based on a form of cryptography it's not possible to predict the numbers that would be displayed without the secret keys held by the authentication system. You then simply "prove" you have your phone or key chain fob by entering the number displayed on it when requested. Another factor that can be used is something you are, which typically boils down to facial recognition, fingerprint scanning or other biometric measurement. While each can be used in isolation – something you know, something you have or something you are – as the very common "single factor authentication", requiring more than one increases security dramatically. While two-factor authentication naturally requires two, it's actually a subset of "multi-factor authentication" which can require two or more. I also receive e-mails with the broken image icon, but at the bottom of the e-mail are all the picture in thumbnail view. If i click on the view buttom they show up as a slide show. this does not happen all the time. I am using chrome and yahoo mail. After doing all of the above, take *another* image backup. That way, you can always get the system back to the way you originally configured/updated/etc'ed it, without having to go back to "factory fresh" and re-apply everything. Microsoft's Enhanced Mitigation Experience Toolkit (EMET) -- https://www.microsoft.com/en-us/download/details.aspx?id=43714 (also see http://www.securityweek.com/microsoft-emet-51-brings-improved-security-and-compatibility). Though MS does not list XP as a supported OS, it will run (SP3 with .NET 4.0). SurfRight's HitmanPro.Alert, with CryptoGuard -- http://www.surfright.nl/en/cryptoguard . I have these applications running on more than a dozen Windows boxes, from XP through 8.1.1, with zero adverse issues (though on some systems, EMET may need to be tweaked; do a web search for specific issues, should any be encountered). As we pass through the holiday gift-giving season and the year winds down, we have a great opportunity to make some decisions. Acting on these decisions will increase your security, decrease your frustration, and virtually eliminate the potential for catastrophic data loss. Call them "resolutions" if you like. But no matter what you call them, resolve to take them to heart in the new year.